"A thin, spicy gingersnap cookie." In a large bowl, cream the shortening and sugar. Add the egg and beat until light and fluffy, then stir in the molasses. In a separate bowl, mix together the flour, baking soda, salt, ginger and cinnamon. Add to the egg mixture and stir until well blended. Roll bits of dough into 1 inch balls. Dip each ball in sugar and place on cookie sheet, sugared side up about 2 inches apart. Bake for 10 to 12 minutes, until cookies have spread and tops have cracked. Let cool on wire rack. Chef John shows you how to make fresh, homemade and customized crackers! Amazing! 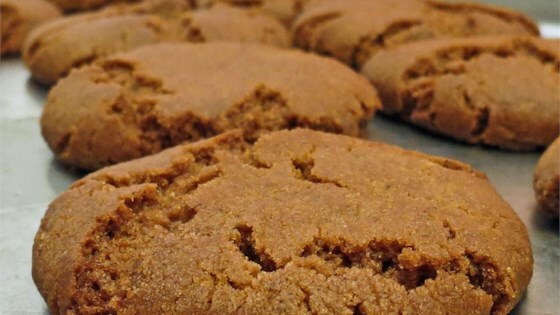 I have been looking for a thin crispy gingersnap recipe and this was perfect. I did substitute real butter for the shortening to eliminate any trans fats. These are the best gingersnaps I have ever had! They're crispy on the outside and slightly soft in the center and super easy to make!